Note: PDF Purchase comes with two versions: landscape and portrait layout. Welcome to the Gateway Roleplaying System. Gateway is a universal roleplaying game, adaptable to any setting or situation you can think of. 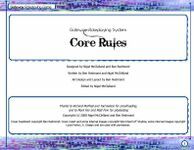 This book introduces you to the core rules of the system, including character creation and development, and dramatic resolution - Gateway’s unique system for resolving any dramatic event in your game. Unlike other universal roleplaying games, Gateway doesn't compromise game flavour or atmosphere for the sake of uniform systems. Gateway’s combination of versatile character traits, adaptable core systems and unique game mechanic features allow it to adapt to any game concept you wish.